God's Best Gift: When and How did you know?? ... that you want to spend the rest of your life with your spouse? That he/she is THE ONE? We’ll be celebrating our 1 year and 10 months anniversary soon and as response to the question above which I got from Mec’s blog.. I will try my best to write and remember right the whens and hows of our lovestory. I saw Rudolf June 0f 2003, It’s a Sunday..I went to their church with my cousin Michelle who is by then attending the Sunday worship regularly. Me on the other side keep on postponing the invitation as I tell her every Sunday that it’s only my rest day. I was then a backslider Christian, currently in a painful relationship, emotionally abused and busy at work. I saw him agad because he’s leading the worship..and I remember one particular song he’s singing..”Open the eyes of my heart Lord”. I actually told my cousin..what a beautiful voice..seems like I’m hearing it on a CD..Two or three more Sundays of regularly attending the service, we were finally introduce, a lot of them “interns” from LJBC (Lord Jesus Bible Church) approach us right after the service and introduce themselves. We then became friends instantly,,me and my then officemate/friend Viviane often found ourselves making tambay in the LJBC center,(it’s actually a big house where missionaries of the church live). After office hours, we will go and drop by at the center, we will bring some food with us. There’s this inviting spirit in this place..It feels so peaceful to be there..talking about the lives of the people who live there..thier service to God and everything…but that’s another story I guess..
And Rudolf and I became so good friends..untill we found out he had a crush on my friend Viviane..so they were being tease everyday and eventually got together..so sad that after a while, Viviane had to leave Manila and go back to Cebu, leaving Rudolf behind, that was December of 2003. I know Viviane was her very first girlfriend, and he was deeply hurt when they broke up 6 months after. Long distance relationship doesn’t seem to work for both of them. All this time, me and Rudolf has developed a special friendship between us, he’s always with me..we’re often seen together..to the point that we were being tease together..but I said it cannot be..I was still madly inlove with my then on & off boyfriend for 4 years..although he was abroad that time..and the fact that I am 8 years older than him..so it’s really impossible for us to be in love..or so I thought…. The year 2004 made us even more closer..but the year 2005 has been a year of testing for us. 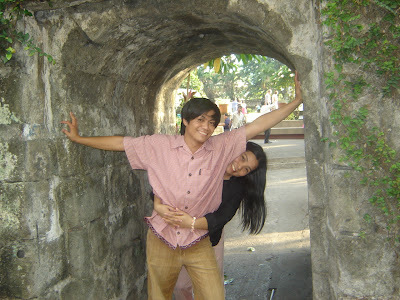 By December of 2004, he already knew..hmnnn..sige na nga..we both then knew that there is something special going on between us..but neither wants to admit. And so we kinda separated…he became so aloof and we started building wall between us..that was December until March of 2005. But God has planned something wonderful for us..I broke up with my then boyfriend..and started to move on..
Rudolf kept on praying about us and when He realized that God is working with us, he came to me and just said he loves me and that it would be hard for both of us because of our age difference..not only that..with our lifestyle so different..but if God is with us..we could make this work. It was not a fairytale story, we had lots of troubles and issues too..but we have the Lord..
On April 18, 2005..we had a talk with Kuya Mar (our head Pastor now) and told him about us and ask his permission and his blessing. And so he prayed for us. At that time, I knew he was the one already..that I am now ready to spend the rest of my life with him. How did I know? God told me so..I have asked and asked..and yes, God do answer..in many many ways. In his words, through other people, even through some incidents. June 0f 2005..we started planning for our wedding..everyone was happy for us..even my parents, even my friends..they know God can never go wrong.and on April 21 2006, we tied the knot. He didn’t courted me..God courted me for him. We were made for each other. We are each other’s God’s special gift. All those events in my life lead me right into where his “best” was.